Our doctors perform complete eye exams for people of all ages. Different age groups and different complaints warrant different types of exams, tailored to specific needs. However, general, comprehensive exams are the norm. In young children, checking vision may be difficult. 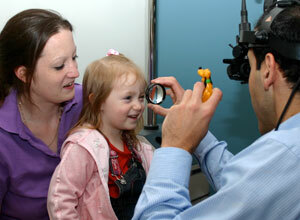 Our doctors are able to assess vision using lights, prisms, pictures or letters as indicated. Further evaluation of eye muscle alignment, external eye health and the retina is routinely performed. Typically, eye drops are used to aid in the eye exam. Often children's eyes remain dilated all day after an appointment. Avoidance of bright light and minimizing near vision tasks (such as reading) will make this time period more comfortable. Using a combination of simple toys and high-tech instruments, valuable information is learned from evaluating a child's eyes -- even the exact prescription. Our doctors are experienced at knowing what to look for during the short attention span of children to diagnose even the most difficult problems while keeping them at ease. Don't underestimate the importance of specialty training and experience in a pediatric eye exam. A child may not be able to describe his or her eye problem. It is often subtleties picked up during the exam that allow a good eye doctor to find and treat potentially sight-threatening problems. Adult eye exams may also involve particular challenges, such as a person in a wheelchair or a senior with dementia. Our office is welcoming of all individuals and is designed appropriately. For the majority of adults, an eye exam should be pleasant and painless. Routine evaluation for glasses, glaucoma, dry eye, cataracts, and macular problems is the norm. Modern equipment allows advanced testing for most eye disorders. Our ocular imaging equipment, ultrasound, visual field analyzer and other instrumentation provide accurate disease-specific diagnoses. As in pediatric exams, eye drops are often used for adults. However, side effects last only several hours.